Yes2Life (a Pro-Life Outreach) in collaboration with Adesoro Segun Emmanuel; a Nigerian Contemporary Poet & Pro-Life Activist call on poets at home and abroad to be liberating voices towards preserving, promoting & protecting the sanctity of Human lives especially that of the most vulnerable & innocent ones — THE UNBORN, through poetry. • Subject of mail should be: 'Life & Abortion'. • E-mail must include: your name, contact info & bio-data not more than 50 words in the body of the email. • Each entry must not exceed 30 lines (blank lines inclusive). • Poem must be sent as an Attached file in .doc, .docx. • Poem must be in 12 point New Times Roman or Garamond font. 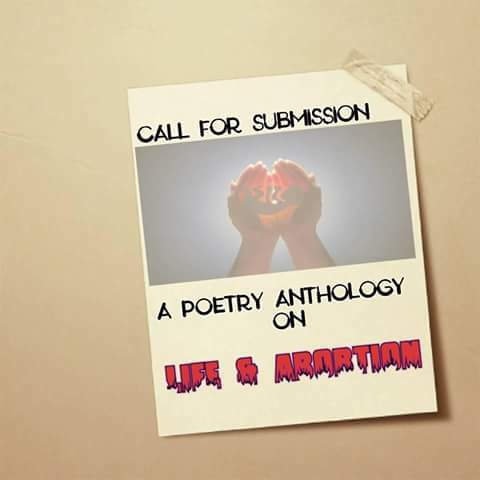 → Submissions to the anthology are open to all willing participants home & abroad. → Submissions are due Saturday, 30th September, 2017. We will attempt to publish all poems submitted, depending upon originality, fulfilling requirements, & space.